Knowing your subscribers' delivery frequency is an important aspect to the timing of your content creation. 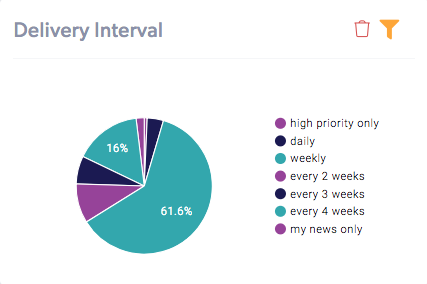 To access this data, create a Custom Dashboard in Insights > Add Components > Delivery Interval. You also have the ability to filter (the orange button in the top right of the component) your statistics by segment, gender, or personalization.